April | 2018 | Scuffalong: Genealogy. April 2018 – Scuffalong: Genealogy. A birthday party in Rankintown. The Record (Statesville, N.C.), 10 December 1937. For an overview of the Petty family, see here. Jacolia Hall was the daughter of Kermit C.J. Hall and Marjorie Petty Hall. James Edward Walker was Macheree’s brother. Delia Petty was Eva Petty Walker’s mother. Eva Petty Walker was the daughter of Lon W. Colvert and Delia Petty. Rest in peace, Louise Holt Tisdale (1925-2018). My great-aunt Mamie‘s eldest daughter, Louise Holt Tisdale, passed peacefully earlier this month after a short illness. Her memorial was held yesterday, on what would have been her 93rd birthday. The family’s great beauty, “Sister” was as lovely within as without, always ready with a warm smile, a hearty laugh and an open door. High school graduation, circa 1943. My favorite photo of Sister. Sister with her mother, left, and aunt, my grandmother. DNA evidence has firmly established that Eva Petty Walker (1911-1999) was the daughter of Lon W. Colvert and Delia Petty. What do we know about the Pettys? 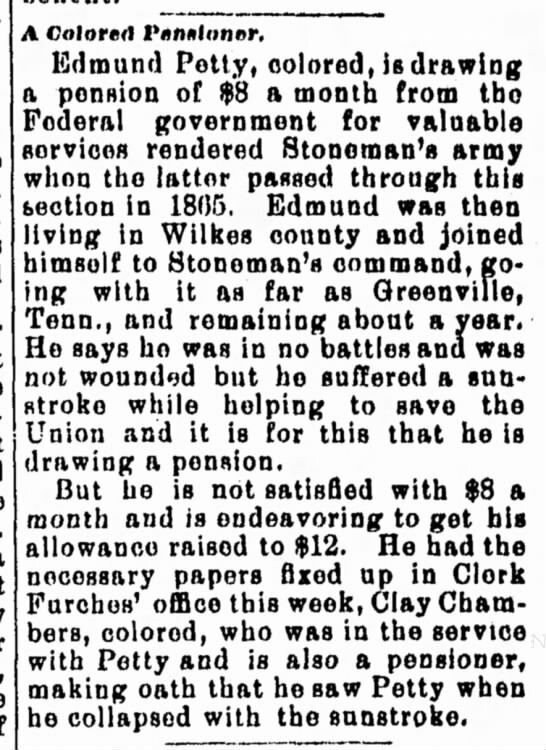 Edmond Petty of Wilkes County, North Carolina, served in the Union Army. More details about that later. In the 1870 census of Fishing Creek township, Wilkes County, North Carolina: farmer E. Petty, 28; wife Easter, 25; and children Linsey, 7, Lilah, 4, and Laura, 6. In the 1880 census of Fishing Creek township, Wilkes County, North Carolina: farmer Edmond Pettey, 49; wife Ester, 47; and children Linsey, 21, Lilly 14, Deliar, 3, and Clary, 1. On 6 April 1898, Edmond Petty, 68, married Lillia Barber, 19, at the bride’s house in Wilkes County in the presence of John Barber and Bill Jones. In the 1900 census of Statesville, Iredell County, North Carolina: farmer Edman Petty, 70, widow, and daughter Delia, 26, a tobacco factory worker. On 22 August 1901, Edmond Petty dictated his last will and testament. 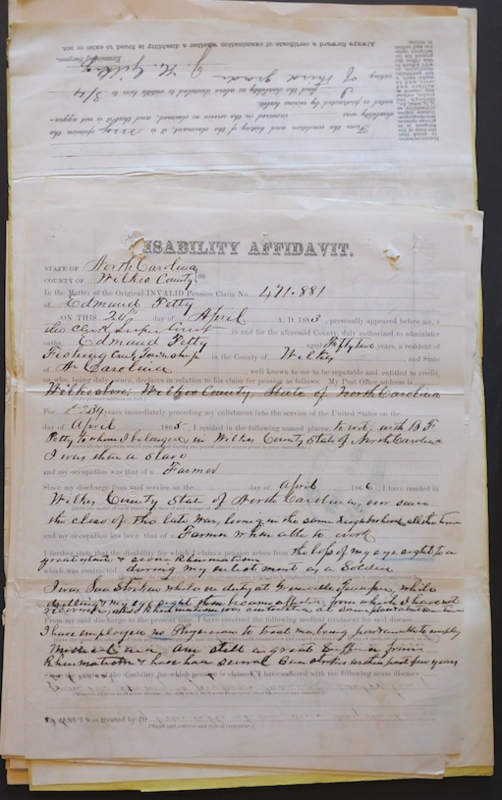 To his daughter Delia Petty, he left all his real and personal property, including his household and kitchen furniture, a horse, a wagon, a buggy, a house and four acres adjacent to the James Mitchell’s land at Rankintown, north of Statesville, and an additional four-acre lot. Delia was also named executor. Edmond noted specifically that his wife Lillie Petty, formerly Lillie Barber, was to inherit nothing from his estate, having abandoned him in October 1898 [six months after they were married] and taken up with Vance Gentry, with whom she had had a child. “Resist any claim [by her] to the fullest.” The will entered probate in Iredell County on 24 June 1907. Per findagrave.com, Edmond Petty is buried in Green Street cemetery in Statesville, and his gravestone shows birth and death dates of 23 July 1830 and 16 May 1907. In the 1920 census of Statesville, Iredell County, North Carolina: in Rankinville suburb, Delia Petty, 42, and children Rene M., 12, Eva, 8, and Margaree, 5. Rena May Petty died 6 May 1924 in Statesville. Per her death certificate, she was 16 years old; was born “illegitimate” to Delia Petty in Statesville; and was buried in the colored cemetery. In the 1930 census of Statesville, Iredell County, North Carolina: cook Delia Pettie, 50, and daughters Eva, 17, and Margie, 14. On 14 June 1930, Gilmer Walker, 26, son of Robert and Minnie Walker, married Eva Petty, 18, daughter of Lon Colbert and Delia Petty, in Iredell County. Delia Petty, Marjorie Petty and Sula Stewart were witnesses. On 22 December 1934, Marjorie Petty, 19, married Kermit C.J. Hall, 24, in Iredell County. Gilmer Walker, Eva Walker and Gertrude Frost witnessed. In the 1940 census of Statesville, Iredell County, North Carolina: in Rankintown suburb, rayon mill sweeper Gilmer Walker, 38; wife Eva, 26; children James E., 7, Delia M., 4, and Eva J., 5 months; and mother-in-law Delia Petty, age illegible. [Per a 6 August 1945 Record & Landmark article, Walker worked for the Duchess Throwing Company, a division of Burlington Industries.] Also in Rankintown: Kermit J. Hall, 30, odd jobs laborer; wife Marjorie, 24; and children Jacolia, 4, and Katie L., 1, with two lodgers. Gilmer Walker Jr., age 10 weeks, died of head injuries suffered in an automobile accident involving Gilmer Walker Sr. and another driver, who was charged. Delia Petty died 28 June 1949 in Statesville, Iredell County. Per her death certificate, she was born March 1876 in Wilkesboro, North Carolina, to Edmond Petty and an unknown mother; was a widow; resided on North Brevard extension [North Brevard and Hartness Streets]; and was buried in Belmont cemetery. Informant was Eva Walker. Most of Delia Petty’s descendants moved to the greater New York City area after World War II.